The new semester brings plenty to do on campus. Enjoy a walk in Lullwater Preserve to increase your steps for the Move More Challenge, explore new exhibits, learn from renowned scholars, and much more. 1. See your favorite comic book heroes on the big screen. Emory Cinematheque's fall film series is a tribute to large-than-life characters who got their start in print. “Drawn to Film: From Comics to Cinema" launched Aug. 31 and continues through Nov. 30, with free screenings (and free popcorn!) on Wednesdays at 7:30 p.m. in White Hall Room 208. September's schedule includes "Prince Valiant" (1954) on Sept. 7, "Barbarella" (1968) on Sept. 14, "Flash Gordon" (1980) on Sept. 21, and "Popeye" (1980) on Sept. 28. 2. "Move More" with a walk in Lullwater Preserve. While the weather is still hot, cool off with a walk or run in the shade of Lullwater Preserve. 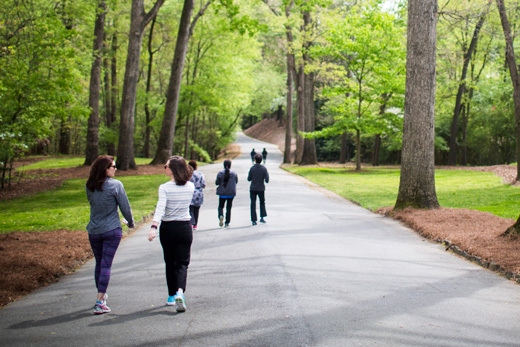 It's a great escape from the hustle and bustle of campus and an excellent way for employees participating in the Move More Challenge to add more steps to their day. Register by Sept. 9 for this year's challenge, which runs Sept. 19 through Nov. 13. 3. Gain insight into current events with campus lectures. Get beyond the headlines with lectures that offer in-depth analysis on some of the most pressing issues of the day. As the presidential election nears, Candler School of Theology hosts a lecture series on "Faith and Politics in the 21st Century," featuring leading public intellectuals and religious and cultural scholars. September lectures include "The End of White Christian America and Its Implications for the 2016 Election" on Sept. 7; "Can Conservative Religion Save Us? Thoughts on the Media, Faith and Democracy" on Sept. 14; "What Would Jesus Do? Developing a Political Economy of Justice" on Sept. 21; and "Faith and Economic Justice" on Sept. 28. All are slated for 6 p.m. in Room 252 in Candler's Rita Anne Rollins Building; registration is required. The James Weldon Johnson Institute for the Study of Race and Difference also kicks off its Fall Colloquium Series this month, with events held on Mondays at 12 p.m. in the Jones Room in Woodruff Library. September's topics include "Race and Pharmaceutical Research" on Sept. 12; "Black Citizenship in Costa Rica" on Sept. 19 and "White Memories of Segregation in the South" on Sept. 26. 4. Get inspired by artist and activist Theaster Gates. After speaking at Emory earlier this year during Founders Week, artist and activist Theaster Gates returns in September for a series of events. The award-winning Chicago potter and artist, best known for turning abandoned buildings in neglected neighborhoods into vibrant cultural hubs, sits down with Rose Library Director Rosemary Magee on Friday, Sept. 9, to discuss "Are Artists Activists?" The discussion is set for 4 p.m. in the Rose Library, which is on Level 10 of Woodruff Library. Then on Thursday, Sept. 22, Gates presents his closing presentation, "Social Practice and Social Justice," at 7 p.m. at the Schwartz Center for Performing Arts. Both presentations are free. 5. Make "the invisible visible" at the Sprout Film Festival. Emory's Disability Studies Initiative hosts the Sprout Film Festival, "Making the Invisible Visible," on Saturday, Sept. 10, from 2:30 to 6:30 p.m. in Harland Cinema, in conjunction with Hi Hope, an organization serving adults with intellectual and developmental disabilities, and Sprout, a New York group that has built a library of films about and by this community. The festival is free, but RSVPs are requested. 6. Spend your lunch break enjoying classical music. Take a break from your workday or between classes as the popular John and Linda Cooke Noontime Concert Series returns for the fall semester with a performance by the Vega String Quartet on Friday, Sept. 16, at 12 p.m. (of course!) in Ackerman Hall on level three of the Michael C. Carlos Museum. 7. Cheer on the home team at Emory Eagles athletic events. Emory's fall sports season is getting underway, with plenty of opportunities to cheer on Emory athletes. Games are free and held at the Woodruff PE Center. • Volleyball: Sept. 16 vs. Mary Washington at 5 p.m. and Wellesley at 7:30 p.m.; Sept. 17 vs. Transylvania at 10 a.m. and Maryville at 2 p.m.
• Women's soccer: Sept. 21 vs. Berry at 5 p.m.; Sept. 25 vs. Centre at 1 p.m.
• Men's soccer: Sept. 17 vs. Oglethorpe at 7 p.m.; Sept. 21 vs. Sewanee at 7:30 p.m.; Sept. 27 vs. Piedmont at 7 p.m.
8. Make Tibetan "tsa tsas" with Gonkar Gyatso. Experience a unique opportunity to create art with Tibetan-born British artist Gonkar Gyatso during his residency at the Michael C. Carlos Museum, Sept. 18-24. Along with exhibits and gallery talks, Gyatso will set up a studio space where you can mold Tibetan “tsa tsas" out of clay. Hundreds of these traditional Buddhist offerings will be displayed in the Baker Woodlands behind the museum where they will disintegrate naturally. The studio space will be open Monday through Friday from 10 a.m. to 6 p.m. Museum admission is free for Emory students, faculty and staff. 9. Join the countdown to the First Folio. Emory has been chosen as the Georgia site to display “First Folio! The Book that Gave Us Shakespeare,” a national traveling exhibition of one of the world’s most treasured books. Published in 1623, the First Folio was the first collected edition of Shakespeare's plays and is touring all 50 states in 2016. But while the First Folio won't come to Emory until November, the University is building up to its arrival with a variety of exhibits and special events. Woodruff Library's diverse look at the Bard's influence includes free exhibits on "All the World's an eStage: Shakespeare Postcards in the Digital Age" (Level 3), "A Goodly Commodity: Shakespeare in Pop Culture" (Level 2) and "To the Great Variety of Readers: Publishing Shakespeare," featuring copies of the Second, Third and Fourth Folios (Level 10, Rose Library). You can also catch Theater Emory's performance of "The Boys from Syracuse" (a riff on Shakespeare's "Comedy of Errors") starting Sept. 22; tickets are $6 for students and only $16 for other discount categories including Emory faculty and staff. 10. Eat and learn at the Sustainable Food Fair. Sample locally grown, healthy foods and learn about sustainable agriculture at the Sustainable Food Fair on Friday, Sept. 30, from 10:30 a.m. to 1 p.m. on the Cox Hall Bridge. The annual fall fair is in addition to the weekly Emory Farmers Market, which takes place on Tuesdays from 11 a.m. to 3 p.m. in the same location.